Today a friend shared an article that was titled "To The Parents Who Give Their Kids iPads In Restaurants" and, being in the direct vicinity of two kids who use devices in restaurants, I gave it a look. What was said was a sanctimonious diatribe (my not so humble opinion) that lectures parents on how if you give your kid permission to use an iPad, or any other device in a restaurant, you are: teaching them bad manners, destroying the family environment, dooming your family to a "Cat's In The Cradle" demise (really, the author says this) and annoying other patrons to the point that they cannot enjoy their meals. WELL. I am here to say that I disagree entirely with this article, and I will be happy to tell you why. The kidlets in my life are 8 and 11. They use their devices often. Yes, in restaurants. They also have wonderful relationships with their parents, have very good manners in public, do their homework on time, and enjoy spending time with friends and family as much as any other kid. They also use devices in restaurants, and as the childfree auntie, who is often one of the other people at the table when they are using these devices in restaurants, I see exactly zero problem with them doing so. With that in mind, let's dissect this article's main points as to why using devices in restaurants is perhaps the worst thing a parent can allow, as I roll up my sleeves to make my point. Your children want your attention. The author states that you, the parent, should matter more than the iPad. Well yes, obviously. But this is a public place. This is not your kitchen table, (where, by the way, the kidlets I know are NOT allowed to use their devices,) this is a restaurant. 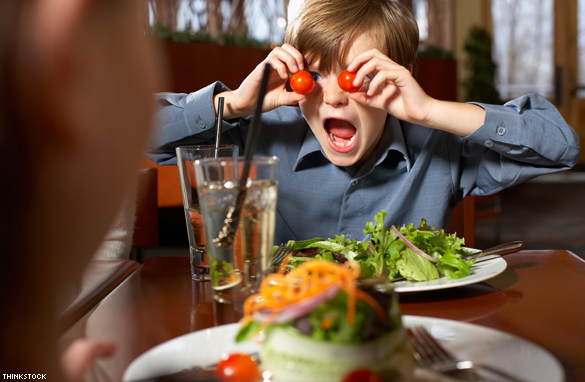 A restaurant where food takes a long time to come out of the kitchen, a restaurant full of other people that can be sensory overload even to an adult, a restaurant that the child may not even want to be that night. This point is a shock topic that doesn't hold water. Next! You're going to lose their attention.The author continues to say that your kids will grow into rotten tweens who don't want anything to do with you, and you need to keep their attention while you can, because, I don't know, by 11 they'll be stealing cars and joining motorcycle gangs. For someone who is "looking out for the children," the author doesn't think too fondly on them once they get to middle school, and again, a restaurant is not your home, where I know I had the big conversations about how my day was, and other personal stuff. A restaurant? That was a big deal when I was a kid, and my job at that restaurant was to be quiet and well behaved. This was before the internet and devices of any sort, but I recall begging my parents to let me bring a book. What better way to be well behaved than to have something to entertain the kids while they are waiting for their food? An iPad at TGIFriday's is not going to doom your kid to a life of crime. What even is this author talking about? You're failing to teach the art of conversation. Ah, and here comes the parent shaming. It's YOUR fault the children won't be able to carry on a conversation because they're playing Candy Crush at the table. Again, this is ridiculous. This isn't your home, this is a restaurant where adults traditionally go to talk to each other, and the kids are expected to behave themselves. You're not going to Friendly's to discuss Chaucer with your 9 year old, you're going there because you didn't feel like cooking, or it's a special occasion, or it's Thursday, I don't know. I never spoke up while we were at dinner at a restaurant, because I was taught to have manners. Kids now use devices to keep them quiet and entertained because that's how "keep quiet and behave at the restaurant" has evolved. Evolution! Something that this author might want to look into. You're setting terrible examples. Whoa! Slow your roll, dear author! The shame! Do you feel it? Is it weighing on you like a flock of albatross? This is the point wherein the author brings up "Cat's In The Cradle" and makes a ridiculous comparison of this song with the distance and lack of love in your family that will occur if you don't solve the world's problems together in a Chili's. Preposterous. Next! It's annoying to other customers. Wait. Waaaaaaaait a minute. Is this person actually saying that whining, crying, and tantrum throwing in a restaurant is preferable to the sounds of an iPad? Guess what, honey. You can mute an iPad. A shrieking 5 year old, not so much. Also? I AM the other customers. We don't mind. Really, we don't. Don't bring us into this lunacy. And there you have it. Yes, everyone is entitled to their own opinions, and everyone has the right to put it on the internet. But I have the right to tell them they are wrong. Especially when the article serves little purpose than to make the author feel smug and other parents feel terribly about themselves. Ugh.